Hydrocolloids are among the most widely used ingredients in the food industry. They function as thickening and gelling agents, texturizers, stabilisers and emulsifiers and in addition have application in areas such as edible coatings and flavour release. Products reformulated for fat reduction are particularly dependent on hydrocolloids for satisfactory sensory quality. They now also find increasing applications in the health area as dietary fibre of low calorific value. The first edition of Handbook of Hydrocolloids provided professionals in the food industry with relevant practical information about the range of hydrocolloid ingredients readily and at the same time authoritatively. It was exceptionally well received and has subsequently been used as the substantive reference on these food ingredients. Extensively revised and expanded and containing eight new chapters, this major new edition strengthens that reputation. Edited by two leading international authorities in the field, the second edition reviews over twenty-five hydrocolloids, covering structure and properties, processing, functionality, applications and regulatory status. Since there is now greater emphasis on the protein hydrocolloids, new chapters on vegetable proteins and egg protein have been added. Coverage of microbial polysaccharides has also been increased and the developing role of the exudate gums recognised, with a new chapter on Gum Ghatti. Protein-polysaccharide complexes are finding increased application in food products and a new chapter on this topic as been added. Two additional chapters reviewing the role of hydrocolloids in emulsification and their role as dietary fibre and subsequent health benefits are also included. 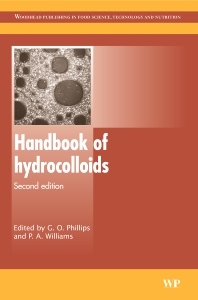 The second edition of Handbook of hydrocolloids is an essential reference for post-graduate students, research scientists and food manufacturers. Other microbial polysaccharides: Pullulan, scleroglucan, elsinan, levan, alternan, dextran etc.